My pretty, kawaii niece Arianna was going to have her first birthday and I'm in charge of her cake! Haha, as always, the favourite aunt of all my nieces, LOL. I do try to use natural colours and pigments whenever I can and am always excited to experiment. 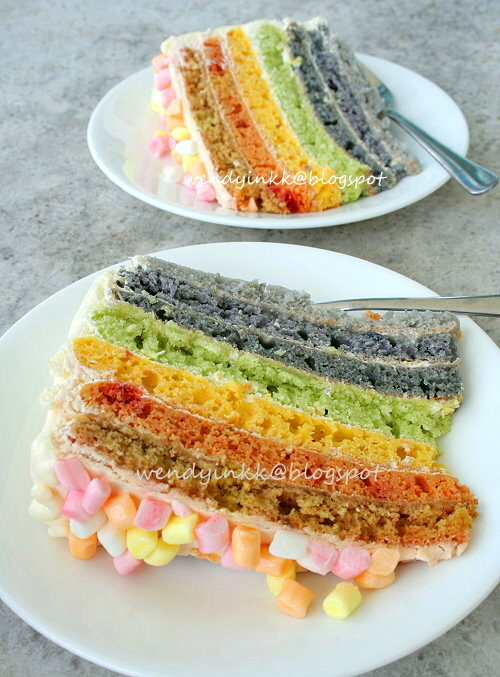 Once during a tea party at Swee San's, she made a beautiful natural rainbow cake and it made all of us WOW! It was from her creation that I was inspired to try making mine, au naturel. not enough frosting to cover the sides, hehehehe. When I decided to make a rainbow cake for Arianna, I dread of the thought of washing the pan again and again and then reheating the oven so many times. It seemed wasteful. And I was also lazy to bake each layer. So, I thought, why not make pancakes. It's a lot easier! Because I don't have the luxury to complete the cake in one day, I did it 2 days in advance. One day to do the pancakes, one day to frost, 3rd day to celebrate with. It was a big mistake! My beetroot layer started to turn brown and the pancakes start to turn crumbly. The softness was gone on the day of celebration! So, for those who wants to try this, I do urge you to do with only 30 hours in advance for best results. still a tinge of redness after 24 hours on the beetroot layer. If you can see the purple layer, it actually looked purplish, but turned blue the next day. Makes a large 10 inch wide, 5 inch tall cake. Easily feeds 20. 1. Prepare the wet ingredients. Put oil, buttermilk and pigment sources together and blend ( I used an immersion blender). Mix with egg. 2. Mix dry ingredients (flour, sugar, baking soda and baking powder) together in a bowl. 3. Pour wet ingredients into the dry ingredients. Combine until a batter is formed, do not overmix. 5. Flip over onto cooling rack to cool off. 6. Stack pancakes, separated with non stick baking paper. Keep chilled until time of use. Spread cream and stack the layers according to sequence. Spread cream over pancake and chill for another 5 hours before serving. It looks pretty and red right??? Urrrrrgh!!! I hate it when it turns starts turning brown the next day, hate hate hate it! Hate it even more when it's really brown on the 3rd day!!! Urrrrgh! wah!! Well done! Looks just as good even though the colours didn't sustain. Oh....this is so BEAUTIFUL!! I am so mesmerized looking at the layer of colours; and you are using healthy fruits/vege as the source for colours. So brilliant! Wow ! it's so colourful and beautiful - reminds me of bollywood. but too tedious for me. really am awe ! Beautiful. Never mind the discolouration. Your effort is worth it's weight in gold. Wow wow, I like the rainbow colours, they are really beautiful.You hv done a great job. 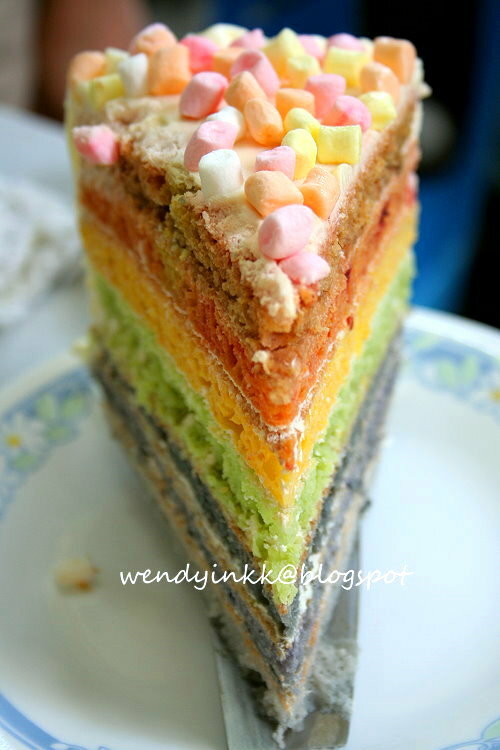 Thanks for showing me, natural rainbow cake can be done. thanks, my brother and SIL loved it a lot. It's really worth it. I like the colors ..... using all natural ingredient . I make 1 steam rainbow cake last week but using coloring. Thinking to try out 1 more round using the follow combination : red - strawberry, orange - orange, yellow - lemon, green - pandan, blue - blueberry, indigo - no idea (so now I can try urs), Purple - purple sweet potato.Do you think it works? Wouw!! With gel colouring, I already KIV due to such tedious job, now, you even made your own natural colour pigments .... I really salute you :) Well done, Wendy! 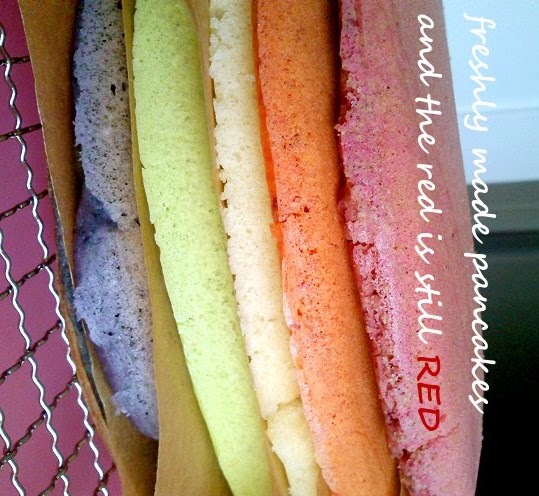 great idea to use all natural colours and do pancake instead of cake, less time needed. But the green layer of pandan, the taste will it be overwhelm to other flavours? Take note that natural pigments are not easy to deal with. Strawberry will not stay red if you blend it and bake, blueberries and purple sweet potato's pigment is pH sensitive and orange juice's colour is not intense at all. You may need to reconsider. For the sake of my niece only, if not I won't do it. Yup, the pandan actually infuses everything, and it's nice because the rest of the pigments don't have much taste. The same happened to Swee San cake, tasted of pandan too. Nope, I won't be making this, just reading the recipe gives me a headache lol! But it is so beautiful, love the first photo a lot! Good idea to make it into pancake. Do u think we can prepare the batter at one go and divide?. Nope. You need the help of the eggs and buttermilk in each portion to help blend the pigments. Must be done by each portion. Thanks， Wendy for the info. Hats off to you yet again, Wendy! A very clever idea to use pancakes instead of cakes. And fabulous with all the natural ingredients. I am sure your niece will be ecstatic to see such a stunning cake. No wonder you are the favourite aunt! Oh very swee! Love the subtle colors from natural food coloring versus those color gel! 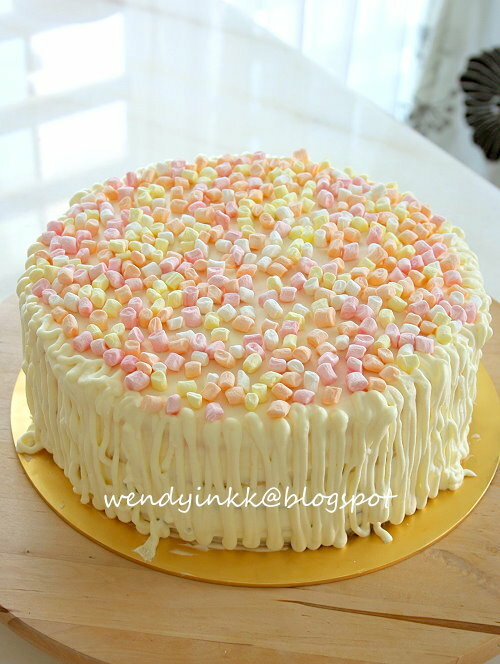 I also want to try baking this but super lazy, lol! Btw, why the last photo orientation is a little weird leh? PanCakes really is a good idea. WOW! if i prepare the coloring by following the quantity u stated, do u think it can work for cake, too? will it affect the texture of the cake? for the beetroots and carrots, is it to be grated and then squeezed and use the juice? or do i use the whole thing mixed in the cake batter? if to mix in the cake, is it still necessary to put in those two agents? 1. Whether it affects ur cake or not, depends on the recipe, whether it allows the use of liquids or not. 2. As said in the recipe, they are blended, used as a puree. Juice's colour will not stay so well and is less heat stable, especially for beetroot. 3. Baking powder and baking soda is not the same thing and they perform differently. Which to add, depends on the pH nature of the batter. If you are not familiar with ingredient substitution and recipe tweaking, I suggest you stick to a tried and tested recipe to avoid frustration. Natural colours are not easy to work with. But if you are confident with it, sure, go ahead. Then quite waste to use the expensive ingredients like blackberries and bluberries ho..can not taste them..but at least healthy lar..
come u home steal the receipt lioa..
good idea for using frying pan!! It's so pretty. Too much work involved, certainly not for me. Makan, can! I SUPER SUPER LOVE the fact that you don't use artifical colouring. I'm bookmarking this page simply for all the ideas on getting natural colours out of the food we eat! If there's other alternatives for colour, I don't mind using, but anything blue or purple is usually berries lor. and that few pieces won't have any taste la, very few only. I do not have a microwave. So how else can I prepare the berries? Thank you! Wendy, there is nothing wrong with this cake! actually I love yours better, than a rainbow cake on the market now on, they put too much colors on food, its too scary to me . 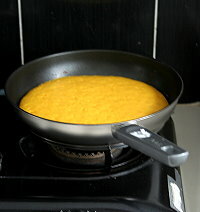 Really creative using pancake to make a cake. Very impress with the natural colours that you use. A lot of effort and love. You really amazing! I hate artificial food colors, they are noxious, so I love your idea to use natural food. Wendy this cake is awesome...very pretty. I love the idea of natural food color. Lovely. I loved this cake of yours and just had to have a look at it again, and can i suggest bunga telang for the blue pigment. will it do ? Haha, cos you didn't taste it. Yeah, and bring that little bit of sunshine into the house, Awww.. that's warm. Haha, me kiamsap with electric, that's why make on stove, haha. wow, this is crazy, lady! but if you sell it, i will buy it!! Wow! It truely looks amazing. ...and what a clever idea with the pancakes. - perhaps for my little one's 1st b'day. I always cannot resist colorful bakes, this is really very pretty, love the colors. Sorry, I accidentally posted my comment under anonymous... I am the one suggesting red dragon fruit as substitute. sorry again. So very pretty....I definitely love it. Just wanna double check with you on the green, purple & indigo layers. It means to add additional 1/4 tsp bp and minus baking soda from the batter? Yes. Because baking soda will prevent it from having a pinkish hue. Am planning to do this cake for my nephew 1 year old birthday, if i used dragon fruit for the red layer is it ok? I plan to substitute cream cheese instead of whipped dairy cream. Would it go well with the pancakes, taste wise, how much should i prepare then, 250g of cream cheese? Hi Wendy, Sorry that I didnt saw that you have answered the Dragon fruit question in the previous comment, noted on that and many thanks! pure cream cheese could be quite "powerful". This huge pancake stack is already very filling, with cream cheese, even more! 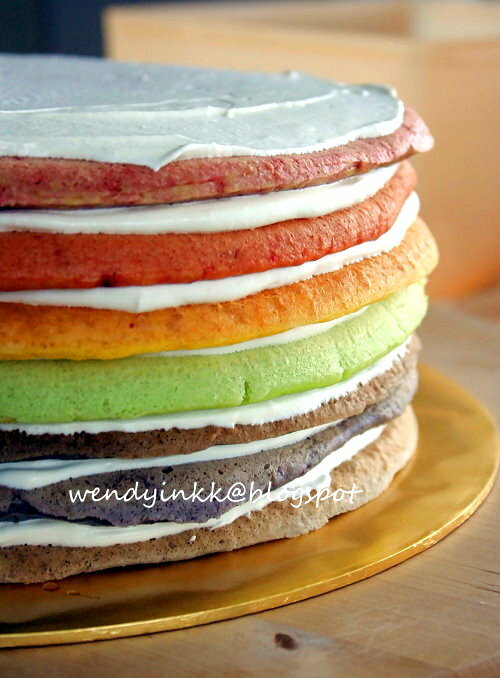 Hi Wendy, the dairy whipped cream method you mentioned to refer from Chocolate Engima cake right, however you did not mentioned the respective amount needed for frosting this rainbow cake. you stated required amount for rainbow cake is 500g whipped dairy cream but is the frosting amount in chocolate Engima cake recipe enough to frost this rainbow cake? How do I scale up the ingredients to yield 500gm whipped dairy cream? Thanks a zillion for answering this question. I know you are bazillion busy. First of all, this pancake stack taste best when fresh. Kept long, and it turns crumbly, not nice at all. To prepare 500gm whipped cream, just weigh out 500gm of it from the carton. Just do some calculations to make up the adjustments needed. No need to be super accurate with gelatin and water and sugar. You can eyeball it.